At a San Diego, Calif. trainer, over rounds of virtual underway replenishments, man overboards, and pierside moorings, the Navy’s top junior officer shipdriver emerged from a field of 28 finalists, the Navy announced Friday. And the 2010 winner is… Lt. j.g. 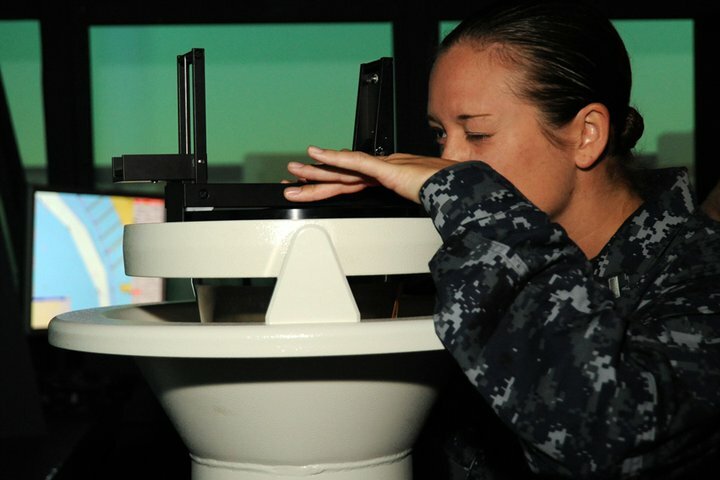 Nicole Lobecker, assistant combat systems officer on cruiser Port Royal. The contestants were graded on engine and rudder commands, obeying the rules of the road, and executing a navigation plan, but also being able to improvise. In the end, it came down to Lobecker and Lt. Matt Klock, navigation officer onboard destroyer Truxtun. Lobecker won. Curtis summed up the message with a quote from former Fleet Admiral Ernest King: “The mark of a great shiphandler is never getting into a situation that requires great shiphandling.